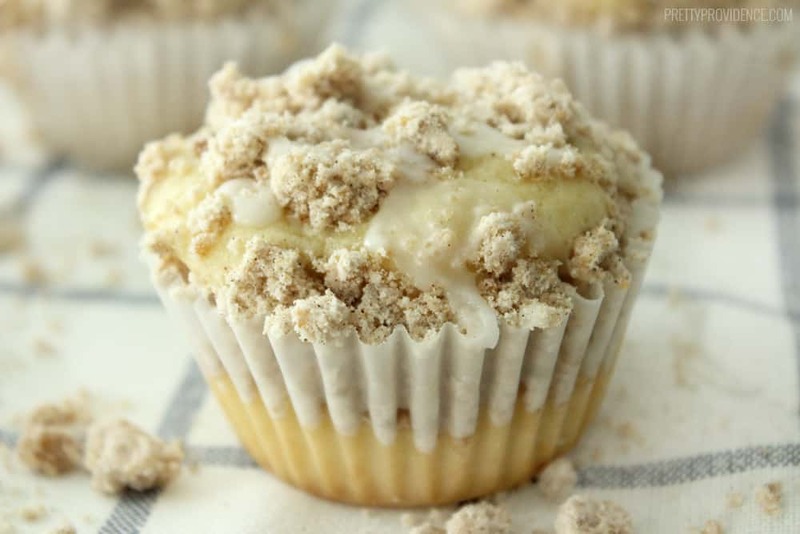 These coffee cake muffins are unbelievably good! From the moist coffee cake base, to the delicious streusel topping to the sweet glaze finish these muffins are sure to hit the spot! I am a major fan of coffee cake. I am also a major fan of muffins. I pretty much could eat a different variation of one or the other every day! What can I say, I love my carbs! We have a few different varieties of each on our site and I honestly love all of them! 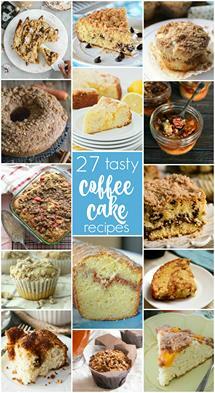 If you are a coffee cake and muffin fanatic like me, here are links to those other recipes. 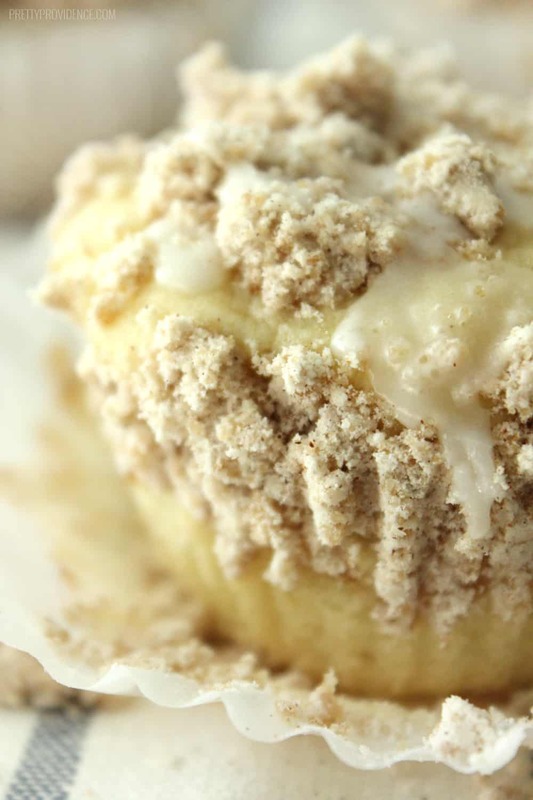 That being said, these easy coffee cake muffins may be my favorite! They are moist, delicious, and freeze really well! 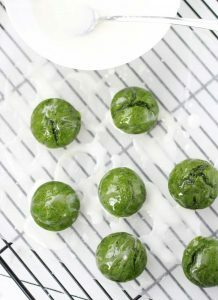 Lots of times I make a big batch of them and stick them in gallon freezer bags for when we need an easy breakfast on the go or something fun to put in my kids lunches! 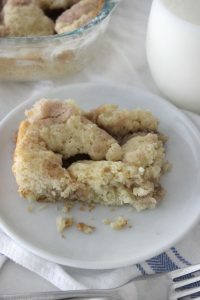 By the time lunch rolls around these cinnamon coffee cake muffins are perfectly thawed, and my kids are always so excited to have a special treat in their lunches! Obviously they are a staple at any brunch type event and are a great shower food too! 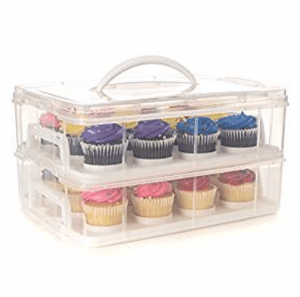 They save well in any air tight container, if you can manage not to eat them all in one sitting ;). 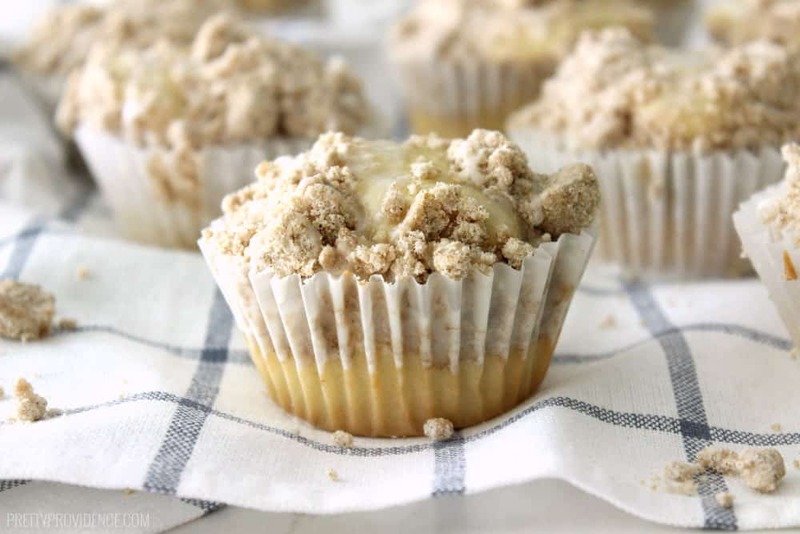 These cinnamon streusel muffins are unbelievably good! From the moist coffee cake base, to the delicious streusel topping to the sweet glaze finish these homemade muffins are sure to hit the spot! 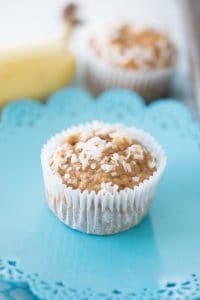 Make streusel topping (see recipe below) and stick in the fridge for 30 minutes to chill while you make your muffin mix. Add butter and eggs into a large bowl or mixer and beat on high until light and fluffy. Add eggs one at a time beating after each addition. Add vanilla. Gradually add in flour, baking soda, baking powder, and salt. Add sour cream and stir until just combined. 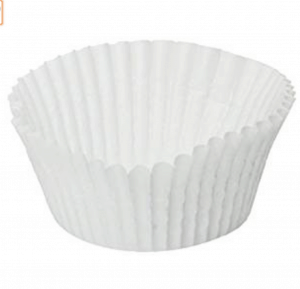 Preheat your oven to 350 and put paper liners in two muffin tins. Divide your batter evenly among your cups (I use a 1/4 cup measuring cup to scoop). 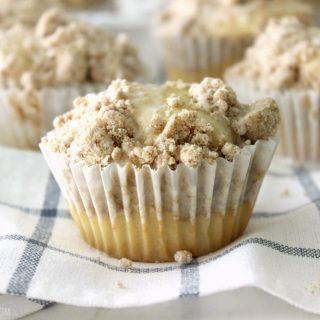 Sprinkle half of your streusel topping evenly over muffins and gently press down into your batter with your hand, then sprinkle the remaining batter evenly over each muffin. 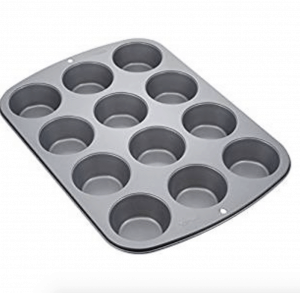 Bake muffins until a toothpick comes out clean, usually 18-20 minutes, rotating tins halfway through bake time. Mix your glaze and use a spoon to drizzle over your muffins. Enjoy! Add together flour, brown sugar, cinnamon and salt. Using a fork, cut in butter until mixture is combined but crumbly. Stick in refrigerator to set. Mmm! 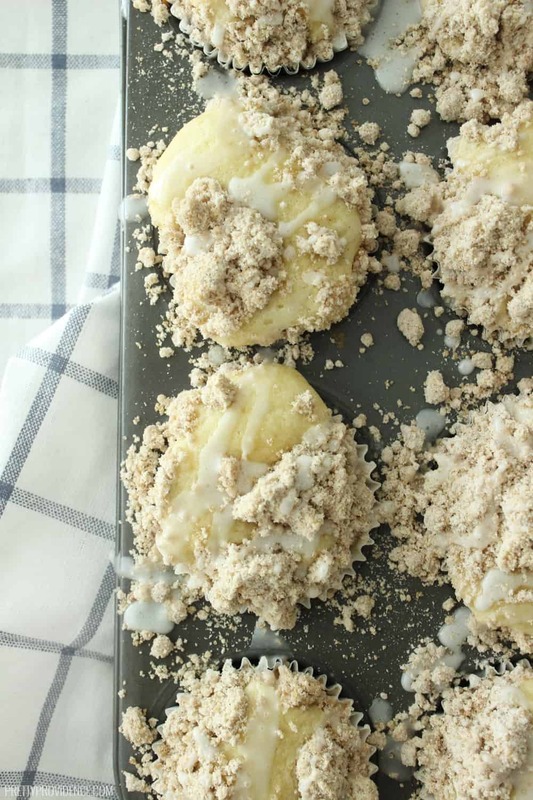 I know the cinnamon streusel topping and the glaze add in a little bit of extra work (you guys know I am usually a lazy cook) but let me assure you, it is so worth it! Feel free to pin the recipe for later or share it with friends! I promise this is the best muffin recipe and you’ll want to come back to them again and again! Oh my goodness you are so welcome!!! I’m so glad you love them as much as we do, thanks for coming back to let us know! Oh my these look delicious! I bet my daughter would love one in her lunch. Thank you so much! I hope she does! I added this to my breakfast board. Looks so good! Can’t get enough of that crumble topping! Right?! The crumble is what dreams are made of! 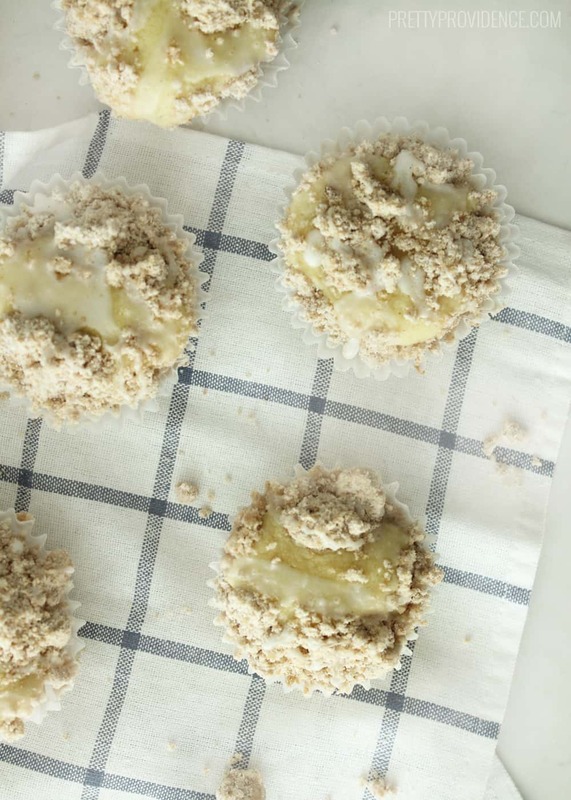 I have a similar coffee cake recipe but never thought to make it as muffins. Can’t wait to try these! It’s a bonus that they bake faster than coffee cake. Less wait time till that first yummy bite! Yes! That is a total bonus! We will have to try your cake out too!